The Frostgrave terrain train keeps steaming forward! 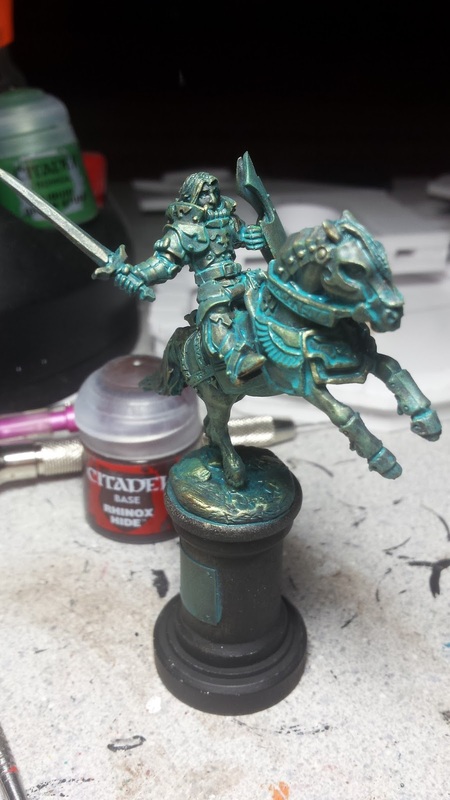 This time I made a statue of a horseman, which I mentioned in my earlier post about starting in on Frostgrave. 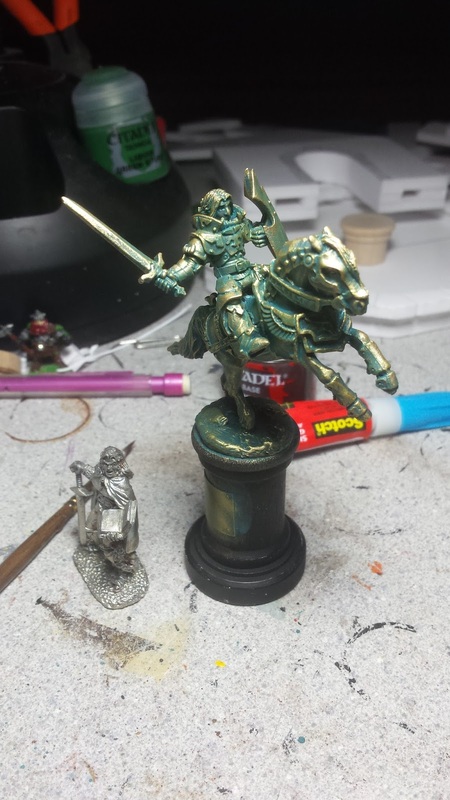 As soon as I saw this mini, I knew he needed to be made into a statue for Frostgrave. The pose is dynamic and looks like something you'd see in a memorial too. It was perfect for a city themed game table. Thanks to some miscellaneous wood bits and some green stuff he was easily turned into a statue. I did run into a few snags while assebmling him though. 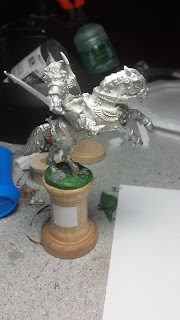 The main issue was the glue I was using, it just wouldn't adhere, even with pins in the metal. 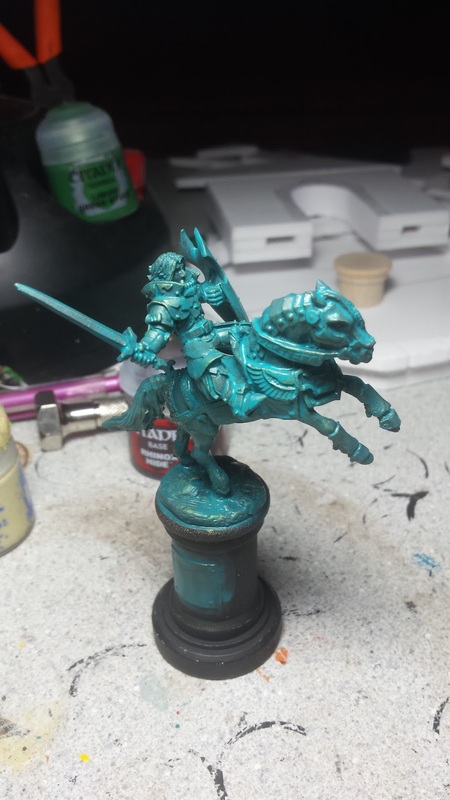 Halfway through painting him, his sheild just plopped off of his arm and he broke loose from the horse too. Luckily I had already bought new glue, because I noticed the issue the previous day and was able to glue him back together and move forward. Another issue I had was a design choice, originally I was going to go with stone, or granite. But thanks to @linguartisan on Twitter, the idea to paint him up as a bronze statue came about. I was instantly sold on it, as I love bronze statue. Plus, since it'd be made of metal instead of stone, I wouldn't need to cut sections off of the minis to help with the ruined/weathered effect. - Mix Citadel Sotek Green and Warboss Green, mixed 3:1 and diluted very thin with water to make a wash and cover the entire mini. Allow the wash to dry fully. 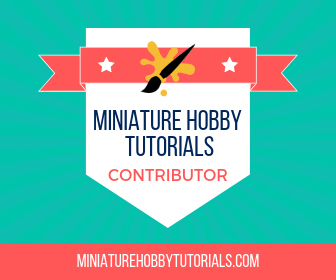 - Mix a small drop of Ushabti Bone into your wash and again cover the entire mini. Allow the wash to dry fully. 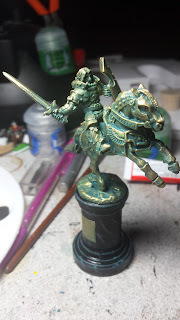 - Mix Brass and Vallejo Old Gold and drybrush lightly again. - Add 2 more drops of Runefang Steel and with a regular, small brush pick out more highlights where needed. 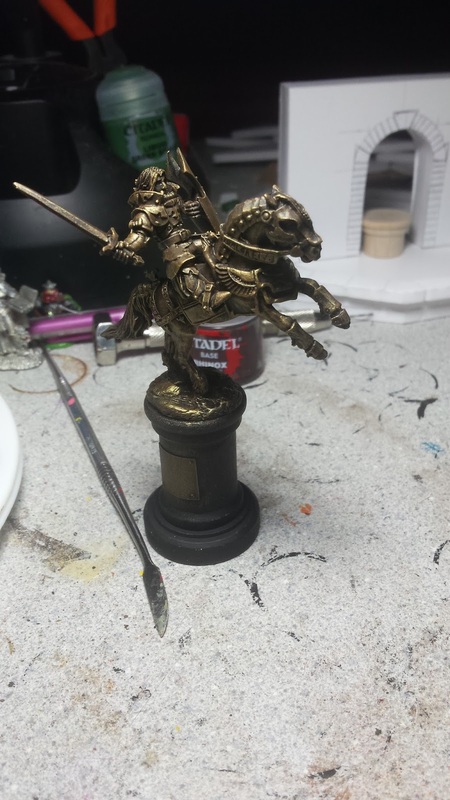 Brass done, it was time to move on to the plinth. But then I realized that I forgot to engrave the plaque. But it was already painted, and I knew that painting lettering on wouldn't look right, since the lettering would have patina in it as well. So I took my hobby knife and started cutting lettering into the plaque (which is made of cardstock) and with that finished I repainted the plaque.The lettering doesn't really stand out though, which was sad, but you can tell there is variation in the surface texture. With the plaque taken care of, I was able to get back to the plinth. I struggled with what I wanted to paint it as, granite brickwork, carved stone or black marble. 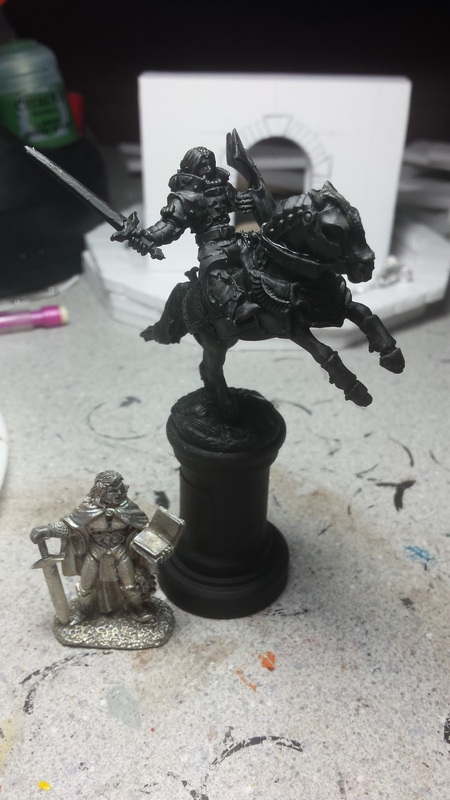 Finally settled on black marble, since it will contrast with the brighter colors of the metals and patina. And it will match with the fountain's centerpiece more. Not to mention, I didn't want to cut grooves into it to for bricks. In order to paint up the marble, I followed Mengel Miniatures' tutorial on it. The effect is really good and fairly easy to do to. The hardest part of it is making the veins. It requires, not only a sharp brush, but the ability to create random streaks that actually look random. But I think this turned out pretty solid, for my second time doing it. All the painting taken care of, it was time to winter it up. To do this I mix Elmer's Glue with baking soda to get the impression of slushy snow. I'm still playing with the mix though to get the consistency correct and had one minor issue. This slushy snow was then added to any places where it would logically gather on the statue, such as the top of the horse's back, the shoulder's of the knight and on his hilt. It's mostly random, and whatever looks like it would belong there. And that's it! A new terrain piece for Frostgrave all finished!